One of the biggest hurdles in the way of the average citizen getting on board with solar power is the way they look. It’s not hard to understand why—rectangular panels covering the top of your roof is not exactly the kind of thing that ties an aesthetic together, unless you’re going for a Lego/blueprint paper look. 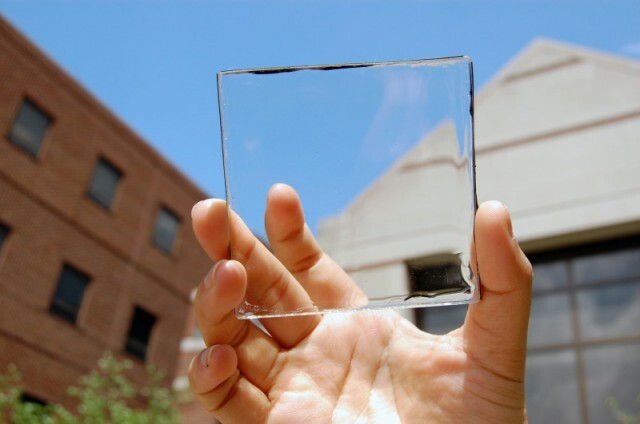 Luckily, this will soon be a problem of the past, and in August 2014 researchers at Michigan State University unveiled a fully transparent solar cell. Aside from the visual benefit, this development also means that the material can be used in a wider variety of applications, including windows and even cell phone screens. It’s not the first of its kind—a previous transparent solar cell was created by UCLA and UC Santa Barbara in 2012, but it was only 70% transparent and cast a colorful shadow. The reason why it’s been so difficult to get solar panels to be transparent in the past has to do with how standard solar panels capture energy. Photovoltaic panels absorb photons from sunlight and convert them into electricity—transparency, however, insinuates that the light passes through the material, rather than being captured by it, so the material can’t actually be completely transparent. At least, that’s what solar innovators initially thought. Michigan State has been able to succeed where others have failed by using a different method for gathering sunlight, which uses a “transparent luminescent solar concentrator.” The TLSC captures ultraviolet and infrared light—which are both non-visible—and then emits it as light to the edge of the panel, where strips of photovoltaic solar cells convert it into electricity. Essentially, it’s a filter for the traditional cells, removing the trappings of photovoltaic collection but retaining the benefits. The TLSC is currently only at 1% percent efficiency—that means that 1% of the light hitting the concentrator is being turned into energy—but the researchers believe they can eventually have it up to 7%. This puts it just a bit behind photovoltaic cells which typically operate at around 11-15% efficiency. That’s not a great number at face value, but it starts to add up when you add multiple TLSCs together—like, say, having every window of your house made of the material. It’s currently unknown when this will come to market, but it’ll be at least a few years, so start saving your pennies now.